Streaming company Silver Wheaton on Thursday added 2.2% building on a 4% jump yesterday, despite news from Barrick Gold that it is delaying Pascua-Lama, a gold-silver project straddling Chile and Argentina, due to cost escalation and complexity. Silver Wheaton is pumping $625 million into Pascua-Lama in exchange for 25% of the life-of-mine silver production from the project. Annual silver production in the first full five years of its 25 year life is expected to average 35 million ounces. Initial gold production is now expected in mid-2014. 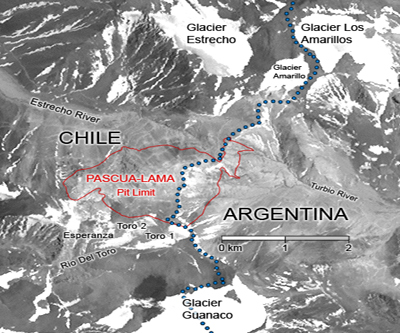 Pascua-Lama will make up a huge chunk of Silver Wheaton's estimated total production of 43 million ounces in 2016 and account for almost all of the company's output growth of 65%. Silver Wheaton will be paying less than $4 an ounce to take the precious metal of Barrick's hands. Randy Smallwood, CEO of the Vancouver-based company, says the deal includes a completion guarantee requiring Barrick to fire Pascua-Lama at minimum 75% of design capacity by end 2015 or risk having to give the money back. In addition if required Silver Wheaton will get a top up from three Barrick mines already producing silver. Barrick announced today a 50-60% cost blow-out for the project which could end up with a final bill of as much as $8 billion with $3 billion already spent. Silver Wheaton still owes Barrick a final payment of $137 million for its share of the project. Silver Wheaton, worth $9.7 billion in Toronto, forecasts 2012 attributable production of some 27 million silver equivalent ounces from 16 mines, mostly in the Americas. Smallwood jokes the company's exposure to silver is "contaminated" by 16,500 stray ounces of gold it gets from the Minto mine in Yukon, Canada. It picks up the yellow metal for $300 an ounce.